My mother has a bookcase filled with novels ranging from the very British mysteries of Agatha Christie to the plot-thin paperbacks of the Harlequin Romance series. While staying in New York over the holiday break I played the Good Son and offered to move the monstrosity out of her bedroom and into the hallway where it had originally been (it had been moved in the summer of 2004 to make room for my father's wheelchair after his stroke). Now that my dad is up-and-at-'em, the piece of furniture was long overdue for a return to its regular spot in the apartment. The majority of my mom's literary picks came from the minds of Agatha Christie, Mary Roberts Reinhart and Robert Ludlum. As I shouted out titles of books to see if she could remember the plots to them, my mother described how she went through different book phases throughout the years. Phase #1: The Historical Epic (somewhere in the late 70s, before she met my father). Phase #2: The International Spy Thriller (during those Reaganomic 80s and probably the 70s, long after her heart was crushed to see Sean Connery retire from the James Bond films). Phase #3: The British Murder Mystery (maintained throughout all three decades of her avid readership). Phase #4: The Trashy Romance (probably when she was glued to her TV set watching Luke marry Laura on General Hospital). We both had a good laugh while we breezed through some of the fluff. 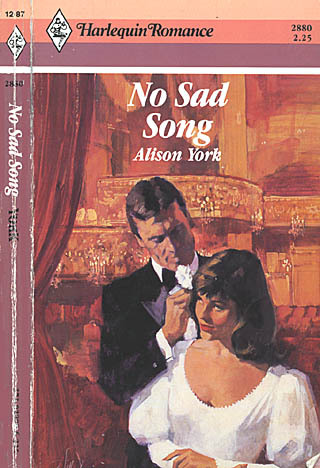 I got a kick out of the elaborate cover art of these sweeping love stories. I would love to meet the people who get paid to sketch collages of ripped torsos, lacy dresses and grand backdrops and write up tempting taglines to accompany it all. Move over, Shoebox Greetings. I now know who to turn to for creating my annual Christmas cards for the fam. Lily Cigar - She was robbed of her innocence to become the legendary lady of love - a fiery saga of illicit passion and scandalous intrigue. The Black Swan - Their forbidden passion was born in one moment...Their love flames beyond time. The Flame and the Flower - In an age of great tumoil, the breathtaking romance of Heather Simmons and Captain Brandon Birmingham spans oceans and continents! Their stormy saga reaches the limits of human passion as we follow Heather's tumultuous journey from poverty..to her kidnapping at a squalid London dockside...to the splendor of Harthaven, the Carolina plantation where Brandon finally probes the depths of Heather's full womanhood! Perusing the covers of these novels - some classic, some downright embarrassing - while reorganizing this personal library, I realized that I am indeed my mother's son. Bookwormdom had always run through my veins. If you were to step inside my old bedroom (now my father's office/den), in one corner you'd find a similar bookcase bursting at the slabs with multitudes of paperbacks and hardcovers. 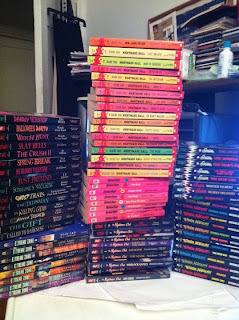 My authors of choice in the early-to-mid-90s were R.L. Stine, Christopher Pike, and Dean Koontz. I collected every teen horror series ever published from 1989 to 1999. I frequently visited Fear Street. I got Goosebumps. I attended Terror Academy and later dormed at Nightmare Hall. I entered the Extreme Zone and became Fearless (the latter, a daring and brilliant series about a girl born without the fear gene, was eventually developed into a failed WB pilot starring Rachael Leigh Cook and Ian Somerhalder). My mother wishes to box all of them up to clear space in the room, but I feel oddly proud to keep them on display, perhaps as a reminder of who I was over a decade ago. Yes, some are definitely not worth rereading (Desperate Pursuit - Someone is stalking Samantha - it's a deadly lesson in love), while others are worthy enough to be brought out of hiding for the sole purpose of kitschy nostalgia. Currently framed and on display in my bathroom is a signed letter I received from R.L. Stine in the summer of 1992. It was in response to a letter I had written in which I expressed my admiration for his ability to write a novel every month and how I wished to follow in his footsteps. Later in life, my idols would change. In high school I strived to be the next Aaron Spelling, and in college, the next David E. Kelley. Nowadays, for those of you who may not know (um, have we met? ), I continue to worship the ground J.J. Abrams walks on (by the way, he's never returned my e-mails). At this rate, someone new should be poised to claim the pedestal, but I have yet to find that successor. I think it will take a while to find someone worthy enough and awe-inspiring to bestow that honor. For now, I'll just carry on with my trivial obsessions, my personal commentaries, my random musings. It's all going in my memoirs anyway. I'd say the next to go on your pedestal should be you. :0D You'll find your dreams coming your way if you see that the one you want to become is yourself.. Speaking of JJ - what are your plans for Cloverfield? I can't wait!